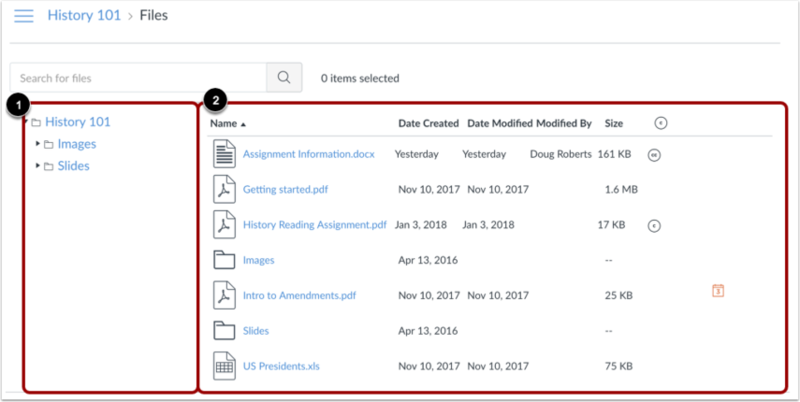 As a student, Files allows you to store files and assignments within Canvas. You can upload one or multiple files, view all details about your files, and preview files. Files is built with responsive design to adjust for browser scaling. The folder navigation window, file displays, and even file names adjust to the width of the browser window. View a video about files. The basic functionality within Files is the same within each files location, but some features may differ according to feature area. The left panel  shows all folders for quick navigation. Some folders may be housed within other folders. To expand all folders, click the arrows next to the folder name. When you click the name of a folder, all contents within the folder you are viewing display in the right panel . You can also click folder names in the right panel to view folder content. For each file, you can view the name of the file , the date the file was created , the date the file was modified  the name of the person who modified the file (if modified by another user) , and the size of the file . You can also view the published status  for your user files. Files are sorted alphabetically. To sort files, click the name of any column heading. Search for files . Files is fully searchable by file name. Add a folder . Add a new folder to Files to store files. Folders can also house other folders. Upload a file . Upload a file to Files. Change the state of the file . Files can be published, unpublished, or include a restricted status. To select a file, click the name of the file. You can also select multiple files at the same time by holding the command (Mac) or control (PC) key. You can also manage some or all options for a selected file within the file's Options menu . Course Files and Group Files may display a column for usage rights. If enabled, the column displays the usage right (copyright) for the file . Files that do not contain a usage right display as a warning icon . To change the usage right for a file in Group Files, click on the usage right icon for that file . Previous Topic:How do I delete my ePortfolio as a student? Next Topic:How do I view my user files as a student? Table of Contents > Files > How do I use Files as a student? Re: Where Can I find My Canvas Drive? Re: Where do i find BUS 6620 data on "Strategic Business Plan Format" under 'files'?